Modern science has concluded that the Island of Lomea never existed. This is particularly puzzling as there is ample geographical and historical evidence that Lomea did indeed exist. Sure, we can’t see it now, but I’ve never understood “out of sight, out of mind” to be a fundamental principle of scientific epistemology. Most disappearing islands conveniently reside in obscure corners of the Atlantic (e.g. Saxemberg) or South Pacific (e.g. Tuanaki), which are obligingly remote and rarely visited, thus tales of vanished lands can be summarily dismissed as nautical or savage folklore. Not so much with Lomea, which had the presumption to appear smack dab in the English Channel about six miles off the Deal coast of Kent, England, complete with real estate records as late as the 11th Century A.D. The Strait of Dover, where the English Channel is at its narrowest was at one point spanned by a solid chalk land bridge connecting Weald in Great Britain to the Boulonnais in the Pas de Calais. Neither the French nor British are happy about this, and consequently they don’t like to talk about it, geologists of either nationality confidently asserting that the entire region was inundated by the ocean sometime between 7600-5000 B.C. This places the presence of any geographical connection firmly outside the existence of either country, and in fact, prior to any historical record at all. Alas, the world prefers to screw with historians. What exists in the approximate original location given for the Island of Lomea are the Goodwin Sands – a ten mile long shifting sandbar and navigational menace eight to fifteen meters beneath the surface that proudly boasts the sinking of over two thousand ships. Obviously a good number of phantom vessels wrecked on the Goodwin Sands are frequently sighted and said to haunt the shoals, including the Lady Lovibond (1748), the S.S. Montrose (1914), and a man-of-war named the H.M.S. Shrewsbery (18th Century). You can’t make a good phantom island without breaking a few ships. By 1817, enough hardy vessels had been dashed to bits on the Goodwin Sands that the Corporation of Trinity House of Deptford Strond, the private organization charged by royal charter with setting up lighthouses in useful places, decided to have a go at marking the area and avoiding future shipwrecks. They commissioned the foremost geologist of the time, Sir Charles Lyell (1797-1875) to survey the area. 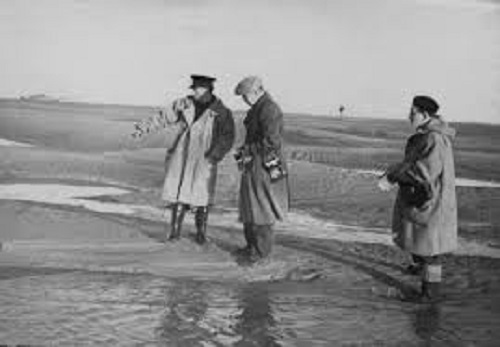 Lyell did some drilling and noted that the sand of Goodwin Sands sat on top of eroded clay with a chalk base, further suggesting that he was clearly looking at the remains of a clay island that had been flooded within historical memory. The Goodwin Sands lie opposite this part of the Kentish coast. They are about ten miles in length, and are in some parts three, and in others seven, miles distant from the shore; and for a certain space, are laid bare at low water. That they are a remnant of land, and not ‘a mere accumulation of sea sand,’ as Rennel imagined, may be presumed from the fact that, when the erection of a lighthouse on this shoal was in contemplation by the Trinity Board in the year 1817, it was found, by borings, that the bank consisted of fifteen feet of sand, resting on blue clay; and, by subsequent borings, the subjacent chalk has been reached. An obscure tradition has come down to us, that the estates of Earl Goodwin, the father of Harold, who died in the year 1053, were situated here, and some have conjectured that they were overwhelmed by the flood mentioned in the Saxon chronicle, sub anno 1099. The last remains of an island, consisting, like Sheppey, of clay, may perhaps have been carried away about that time (Lyell, 1889, p530-531). Not too shabby for an island that most folks were maintaining couldn’t possibly have existed after 5000 B.C. Now, the Romans who were nigh well obsessed with documenting the geography of the known world mostly so they could come, see, and conquer it, also mentioned a curious feature in the area which they called the Infera Insula (“Low Island”). Julius Caesar was getting around to invading Britain around 43 B.C., and just so happened to land his armies on the Kentish coast, establishing an encampment and portage for his fleet at Portus Rutupinus (modern Richborough), from which three distinct nearby islands were described as visible: (1) The Isle of Thanet (hasn’t really been an island since the 19th Century), (2) Rutupiae (very small and now roughly two and half miles inland), and Infera Insula (in the exact position of Goodwin Sands). It seems awfully judgmental to take two of the three islands and confirm that they are now part of mainland Kent, and then dismiss the third as pure fantasy, especially when people keep running boats into it. You can’t always rely on the Romans, particularly if you can’t find the specific Roman who supposedly mentioned Lomea, but suffice it to say, we have slightly better records from the 11th Century A.D. attesting to the continued existence of Lomea. Between about 1016-1035 A.D. a large swath of England, Denmark, Norway, and Sweden were ruled by Canute the Great, the big kahuna of the short-lived and rarely mentioned Anglo-Scandinavian Empire. Canute’s good buddy and comrade-in-arms Godwin (1001-1053) was shortly made Earl of Wessex, and one of the many plus sides to being an earl is that people give you stuff. In this case, the fertile farmland of the Island of Lomea. The disadvantage to being an earl is that when your liege lord sours on you or a change of administration takes place, your prized possessions are appropriated and given to someone deemed more worthy. The Island of Lomea was said to have been wrested away from Godwin by William the Conqueror (1028-1087) and handed over to St. Augustine’s Abbey, Canterbury, or as Ebenezer Cobham Brewer noted in exploring the origins of the name Goodwin Sands, “Goodwin Sands consisted at one time of about 4,000 acres of low land fenced from the sea by a wall, belonging to earl Goodwin or Godwin. William the Conqueror bestowed them on the abbey of St. Augustine, at Canterbury, and the abbot allowed the sea-wall to fall into a dilapidated state, so that the sea broke through in 1100 and inundated the whole” (Brewer, 1870, p355). While the timelines and cause of the disappearance of Lomea are debatable, on or around 1100 A.D. the entire island seems to have vanished, its destruction variously attributed to the laziness of an abbot, divine punishment of Earl Godwin for moral depravity, or by a well-documented flood in 1099. Evidence of some serious changes in sea-level were recorded in the Anglo-Saxon Chronicle (started in the 9th Century A.D., but still actively updated until the 12th Century), mentioned a series of sea tide floods along the Kentish coast in 1099, remarking “This year also, on St. Martin’s day, there was so very high a tide, and the damage was so great in consequence, that men remembered not the like to have ever happened before, and the same day was the first of the new moon” (Anglo-Saxon Chronicle, 1099). This seems to have been about the time when contemporary folks agreed that the Island of Lomea was wiped off the map, leaving only the Godwin Sands in its place. A careful study of the whole question in all its bearings, geographical, geological, and historical, will leave little doubt that the Sands were once, as recorded, the Island of Lomea, but submerged in one of the severe convulsions, or earthquakes, mentioned in Belgic as well as British history, and handed down by tradition, which will be fully noticed further on. It is quite certain that changes of a most extraordinary nature must have taken place at very remote periods, long prior to the date of the destruction of the island (A.D. 1099), otherwise how are we to account for the presence of gigantic specimens of teeth, tusks, bones of the mammoth and rhinoceros, which have been repeatedly found deep down in the Sands, and the submarine valleys adjacent? That these regions have been affected by earthquakes, or other powerful convulsions of some sort, is proved by the singular fact that in certain boring operations undertaken at Minster in Thanet — about three miles inland from the coast — oysters were discovered at the depth of twenty-four feet below the surface; and it is an historical fact, asserted by Tacitus and Antoninus, that oysters were found in the levels of the estuary at Rutupium (Richborough), where Caesar anchored his fleet, and these are now covered by nineteen feet of dry land. All this would point to sudden eruption by tempest or earthquake, rather than by general or gradual deposition (Gattie, 1904, p17-18). Despite this, “Most professional geologists think it unlikely that there ever was an island there in the first place” (Fanthorpe & Fanthorpe, 2004, p26), which seems a rather bold statement of “if I don’t see it now, it never existed”. One has to appreciate the insufferably teleological nature of land masses, that is they have intrinsic purposes independent of human use or opinion, or more succinctly, acorns want to become oaks and islands want to stay above sea-level. It makes one wonder how many of the mysterious vanishing islands that have been relegated to the shadowy cave of maritime mythology weren’t just sailor’s fantasies. Expressing his stalwart British patriotism, Winston Churchill declared “We shall defend our island, whatever the cost may be, we shall fight on the beaches, we shall fight on the landing grounds, we shall fight in the fields and in the streets, we shall fight in the hills; we shall never surrender”. Nobody mentioned his mumbled emendation, “Unless the existence of said island moves us a single inch nearer to France”. Anglo-Saxon Chronicle. The Anglo-Saxon Chronicle. New ed. London: G. Bell and sons, ltd., 1912. Brewer, Ebenezer Cobham, 1810-1897. Dictionary of Phrase And Fable: Giving the Derivation, Source, Or Origin of Common Phrases, Allusions, And Words That Have a Tale to Tell. 13th ed., rev. and corr. : Philadelphia: Claxton, 187. Fanthorpe, Lionel & Fanthorpe, Patricia. Unsolved Mysteries of the Sea. Toronto, Canada: Dundurn Press, 2004. Gattie, George Byng. Memorials of the Goodwin Sands, And Their Surroundings, Legendary And Historical … The “Kelkel” ed. London: J.J. Keliher, 1904. Lyell, Charles, Sir, 1797-1875. Principles of Geology: Or, The Modern Changes of the Earth And Its Inhabitants Considered As Illustrative of Geology. 11th and entirely rev. ed. New York: D. Appleton and company, 1889.
of the universal process which has stolen much habitable area for many past millennia.